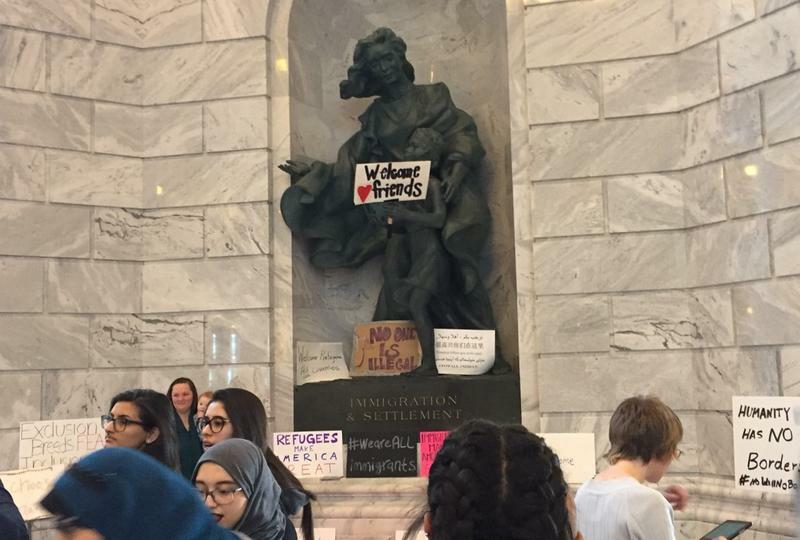 A sign appears in the hands of a statue inside the Utah State Capitol building. "We understand the concern and the fear. We know that you are nervous. But we are here to protect you. And we will protect you!" Biskupski said. Fatima Dire is the Refugee Community Liason for the City. She says that many of the refugees typically resettled in Utah come from countries affected by the ban, including Somalia, Sudan and Iraq and that even a temporary ban of several months will affect Utah’s nonprofit resettlement agencies like Catholic Community Services. Each year, she says, around 1,100 refugees are resettled in the state. But now that number could drop sharply. "So with this ban, four months and you get zero, you can imagine a lot of these agencies will have to lay off people and figure out how to maintain their services and their programming around serving the community that’s still here," Dire said. As of Saturday, President Trump’s Executive Order had been temporarily blocked by a federal judge in Seattle but the Department of Homeland Security said in a statement that the Department of Justice would defend the president’s order.